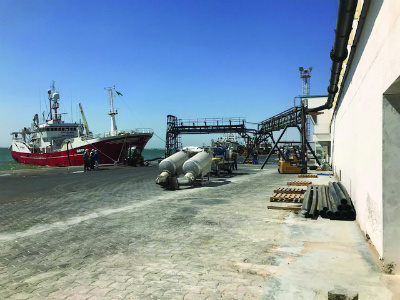 Investment for West African Processing plant by Cap Blanc Pélagique SARL (CBP), who have been operating their fish processing plant and coldstore in the port of Nouadhibou, in the Islamic Republic of Mauritania (West Africa), from the middle of 2018. CBP is a joint-venture of Cornelis Vrolijk Holding BV and Société Mauritanienne d’Armement Pélagique SARL (SMAP). SMAP has been CV’s local agent for over 20 years. The factory processes small pelagic fish for human consumption for the African market. With its activities CBP delivers prime quality deep-frozen pelagic species and secures protein-rich food for the African region. Frido Werleman, Managing Director of CPB is very proud the plant is now operational: “We are one of the first major fish processing plants in Nouadhibou. At full production, we provide about 500,000 healthy and affordable meals for African people per day. Not only do we feed Africa, we also invest in local employment for the coastal community of Nouadhibou. CBP fishes with its own trawler equipped with refrigerated sea water tanks (RSW) that directly delivers its catch to the plant. The target species are small pelagics, mainly sardines, mackerel and horse mackerel. The crew of the vessel consists of Mauritanians, trained by Dutch fishermen. The vessel contributes to sustainable fisheries management and scientific research by data collection at sea, self-sampling and cooperation with scientists. According to Ad Corten, coordinator of the scientific cooperation between Mauritania and the Netherlands: “the Vrolijk company has been extremely cooperative in providing information on their catches and taking scientific observers on board their vessels during the past 20 years”. The new factory provides a welcome alternative to the massive investments in fishmeal, made by foreign investors in Mauritania during recent years. These factories turn pelagic fish into fishmeal and fish-oil that is exported to China. An important source of protein is thereby lost for the West African consumers. The policy of the Mauritanian government is to use more of the pelagic fish for human consumption, and that is precisely what the new factory has been designed for.